Link building seems to be the least favorite part of SEO for most SEOs and Business owners. That is because it is kind of boring & repetitive and also because not many understand how to do it effectively. While I can’t help with the former issue, I can help you with the latter for sure. Applying these 13 lessons that I have learned after sending 5000 link building emails for myself and my clients and several A/B tests will massively increase your email-to-Links rate and increase your chances of hitting the first page of Google! Do you want to freak out a blogger? Then send an email to their email address scraped from site’s whois information. While bulk scraping whois emails for a list of domains might save you 5-6 hours of work, it is not a wise decision because 95 out 100 times, the email used to register a domain is a personal email address like gmail, hotmail etc and people don’t expect to receive an outreach email to that address. Use emails listed on their blogs either by using a scraping software, VA or one of these free chrome extensions. Ignore this lesson and be labeled as a creep like I was. If you plan to build links to a website continuously for the foreseeable future then get an outreach tool right now. The most important benefit of using an outreach tool is being able to see your outreach history with a website owner. In a link building campaign, most of the people you reach out to are people you have never emailed before but the keyword here is MOST. Outreach targets will start to overlap as you conduct multiple link building campaigns over the years. And you need to know who you have contacted before so that you can decide if you want to send the email to them or not & personalize the emails accordingly if you decide to send the email. If you don’t keep track of the outreach history, you will end up sending an email that introduces you and your company as if you talking to them for the first time. And guess what, they will realize they are just another target in an outreach list! 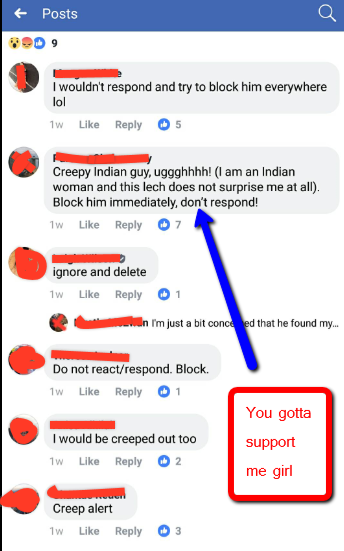 You definitely would not hear back from them after that. My favorite outreach tool is Buzzstream! 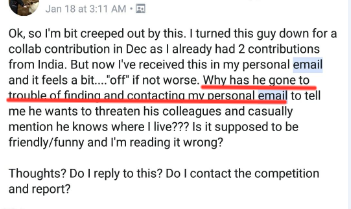 Sending the email to her personal email + this joke made her post about the email in a facebook group (which had other bloggers I reached out to as members too). So I would suggest not to make your emails outrageous especially while doing campaigns in niches where the bloggers have tight knitted online communities and use social media a lot like travel, food, fashion etc. You never know if they get amused (or creeped out) so much that they decide to share it with others online. Your other prospects will realize that you are sending it in bulk. Sending emails to wrong email addresses leads to bounces which can hurt your domain’s sender reputation and it can lower the deliverability rate of your emails. And if not all of your emails are getting delivered to the link building targets, the effort that you put in to find them will be wasted. But you can avoid this with a cheap & quick solution: Email verification. After you have collected email addresses of your list, run it through an email verification service like Never bounce. It will analyze the emails and classify them into categories like Valid, invalid, catchall, unknown and disposable. Valid emails are totally safe to send emails to. Sending emails to catchall emails is tricky. While you can send emails to catch all emails, it depends on how many such emails are on your list. If they constitute 10% or less of your list, you can send an email. 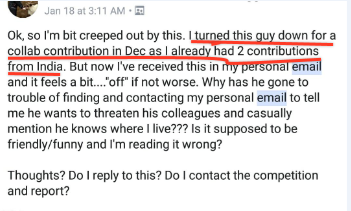 All other types of emails should be discarded and you should try to find some other email address for the associated sites. Look for some other person at company/website to contact. When you are doing email outreach for link building, there is always an exchange of value. You can give the site owner Money, awesome content for free ( a $20 guest post does not count), point out a broken link on their site Etc. The problem with most of these things is that they either cost you a lot of money or time investment. However, you can avoid these investments if you take a moment to take stock of the assets you may already have and then telling the site owners how you can use them to provide value to the site owners. Some examples of what you can do! Using your assets to provide them value often costs much less than giving them money or content. These were the first few sentences of three outreach emails I received recently. If you are emailing a newbie blogger, these statements might make his day. 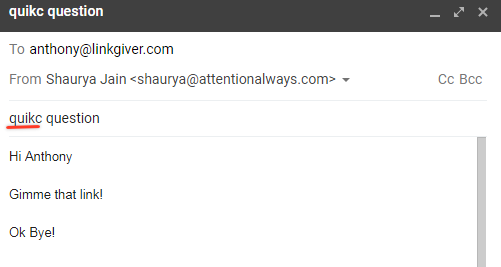 But most site owners are pretty experienced and sending these generic statements will annoy them instead of flatter them because they get dozens of these generic compliments everyday & know you are blasting this templated email to every other blogger. Don’t give a compliment at all. Just get straight to the link request. They will at least know you are an honest person unlike the other people they get mails from who can’t even specify what did they like about their post specifically. You don’t accept a friend request from a faceless facebook profile, why would you give a link to someone you don’t even know how he/she looks, right? Link Building is basically two humans talking to each other via email where one person (You) are convincing the other (them) to link to your site. You obviously know how they are a real person because of their online presence. They too need to know that you are a real person. Including an image of yourself in your emails significantly increases the trust factor of your emails. 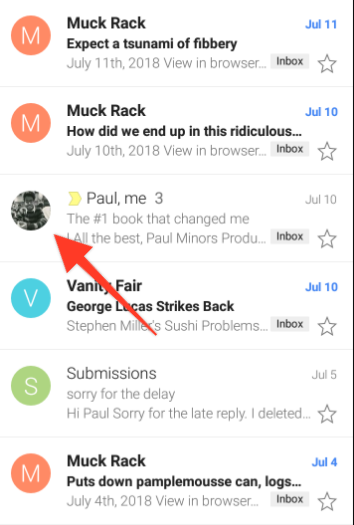 I suggest you to use your image in the circle thingy because using an image in the signature can hurt the deliverability rates of your emails a bit. I hear you ask how to get your picture in the circle thingy? Here is how: Whichever email service provider you are using ( G Suite, Gmail, outlook etc ), there is an option to upload your image and the process is pretty much the same. The sale is in the followup. This is a famous saying in the Sales industry. And it is absolutely true. The sale ( or in our case, link ) is in the follow-up. New sales executives are taught to follow up at least 5 times but we as link builders don’t need to be this aggressive. Two Follow Ups are enough. Not everyone you email will open your email the first you send it. Sometimes Email service providers put your emails in sthe pam folder and it won’t show up in the inbox until you follow up once. Following up shows your conviction and persistence. Even if someone is willing to link out to you after reading your email, he might forget to put it on their todo list. Following up will help you remind such people. There is no excuse not to follow up thanks to the automatic follow up feature in most outreach tools. You can write the follow up emails before hand & they will be automatically sent to the outreach prospects who don’t reply to your previous email. While it’s true, that you need to write good emails which are persuasive, your emails should not be perfect though. What is a perfect email you may ask? One which has impeccable grammar, beautiful formatting, persuasive copywriting, etc. You know what other emails look like this? Newsletters, which are emailed en masse. Do you want your prospects to feel that your email is just one of several hundred emails sent in bulk. No right? They should feel that it is an email tailored just for them by another human being. And the best way to do this is what humans do best: make mistakes in the email. I recommend making a particular type of mistake though: Slapdash mistake. So instead of writing Quick Question in the subject line, you could write Quikc Question or Quick Questino. Basically switching two letters as one would mistakenly do while typing fast. 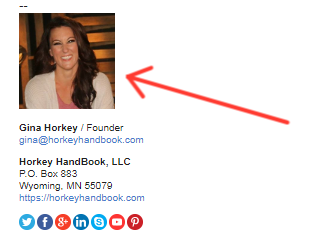 Now if you were to send an email to 100 people, you would make sure it has no mistake. The recipients expect it too. So make a mistake intentionally to make them you are not sending it to dozens of other people. Sometimes you can’t ask for links explicitly like you do in the case of Unlinked brand mentions, resource page links, skyscraper link building etc. Telling someone you want to be internet friends with about a broken link on their site etc. All these cases involve you letting someone know about something which helps them in someway. The problem these emails face is that it does not make sense to follow up to these emails in case they don’t reply, as you want to maintain the leverage you just created by letting them know about the broken link / get more traffic by mentioning them on your blog / made them more famous by including them in your top 50 list. So how do you ensure you maintain that leverage while still ensuring they saw the email and reply to your email. You invent a reason to followup. Letting someone know about the broken link – lets say you are reaching out to a personal finance blogger and letting him know about a broken link. In P.S you could add a question about what their favorite personal finance book is. Now you can follow up about that question instead of the broken link. Mentioning them on your blog – so you just mentioned a famous photographer on your photography tutorials blog. Now in order to start the online relation with him, you have to make him reply but you can’t and should not follow up saying that you mentioned them on your blog again. So you could add a question like – do you want anything added or removed about you in the post? And follow up about that. Included someone in the top 50 List – You just made a list of top 50 blogs and want to send them a badge which they put on their site. After you notify them once about the good news and the badge, you should not follow up saying ‘ hey, we included you in this list, did you have a look’. Therefore, you could add a question in the initial along the lines of ‘if you would like a bigger or smaller size of the badge, let us know’ and then you can send a follow up email to make ask again if they are happy with the size of their badge. There are hundreds of different where you can use this tactic – When you need a reply but don’t want to come across as desperate, just add a question in the email and send follow up email about that. Ask any Organic SEO consultant, what is the Best way to get more traffic than the site on position one even if you rank on position three. He will advise you to write an enticing title that encourages user to click on your site. You have to do something similar in your emails too. When you want to show your content you want links to, to the recipients, please do not make the mistake of linking out from just a word or two like this. Instead, link out to the article with an anchor which is atleast 4 words long and possibly has words incite emotion. Now instead of linking out using the word guide, use How to hire employees that will never leave you to encourage people to click on it. The more prospects, the better the chances are of linking to you. The more people engage with links in your email, the better the deliverability rates of emails will be. This is a big one. If you are using an email address associated with your domain, you should check your domain reputation before the link building campaign and after the campaign. You should check the domain reputation before the campaign to make sure it’s good because if it not, the emails that you will send will not be received and seen by website owners and they will in the spam folder for eternity. Checking it after the campaign is important to make sure whatever bounces you got did not have a big negative effect on your domain reputation which can eaffectthe deliverability of your newsletters, transaction emails and future link building campaigns. You need to stand out to get your emails read and replied to. First, you need to stand out with the subject so that your email gets opened and then you need to stand with the main content of the email so that it is read from start to end and replied to. Although there are a gazillion ways to optimize your subject line and email content for maximum replies, I will share with just one tip for each that will increase your open rates by 28% & replies by 11%. There are a lot of ways to phrase your link request and how you phrase it plays a big part in determining if you will get a link or not. But first, you need to make sure the website owner reader reads your email only then how you phrase your email come into play. How to do it? Use a different font than the default font and see 11 more replies for every 100 emails you send. When the prospect opens the email, he is greeted by a font different than the default font used by most people. iCloud Mail uses Helvetica as a default font. Gmail adopts Arial. Microsoft Outlook uses Calibri. If you use any font other than these, you will stand out for sure in the sea of look-alike emails. So there you have it. 13 lessons I learned after a lot of trial and error. As you must have noticed, you can apply these lessons pretty easily to your next campaign as none of them takes more than 10 minutes to implement. So please don’t be lazy and use this article as a checklist to ensure more replies and links. Share the most important outreach lessons you have learned in the comments below!